Details on how to win a signed copy of this book at the end of the review and links to purchase it. Long-time readers of the popular Savannah Reid series will welcome this spinoff series featuring Savannah’s beloved Granny Reid. In her debut, Granny is in her fifties, while Savannah herself is only twelve. Savannah’s mom, Shirley, isn’t much of a mother. She’d rather be at the local bar, sitting beneath a photo of Elvis, drinking beer and breakfast Bloody Marys. Now that Savannah is twelve, she sees no point in buying new clothes for the kid—her own hand-me-downs are good enough. Flip flops in the winter? Sure, where’s the kid got to go anyway? Macon, Savannah’s dad, is an over-the-road trucker who’s gone more often than not, leaving Shirley to “care” for seven kids. Mostly Gran makes sure they have food to eat, clothes to wear, and hot baths. Of course, one or the other of the kids is into mischief most of the time. Waycross, he’s the artistic one, likes to draw mustaches on faces in newspapers, magazines, posters and just lately, the not-so-lifelike members of the nativity scene. His moustaches are elaborate so his artwork is recognizable. In an effort to repair his vandalism, Gran and Savannah plot how he can paint over his crime under the cover of darkness. They’re just about finished when there’s a loud, agonizing scream. Gran rushes Savannah and Waycross to the nearby Sheriff’s office and rushes to help whoever’s hurt. It turns out to be Prissy Carr, a woman known to be too friendly to the husbands in town which makes for an awful lot of suspects in her death. Shirley is getting worse by the day and her antics are keeping the grapevine busy, too. 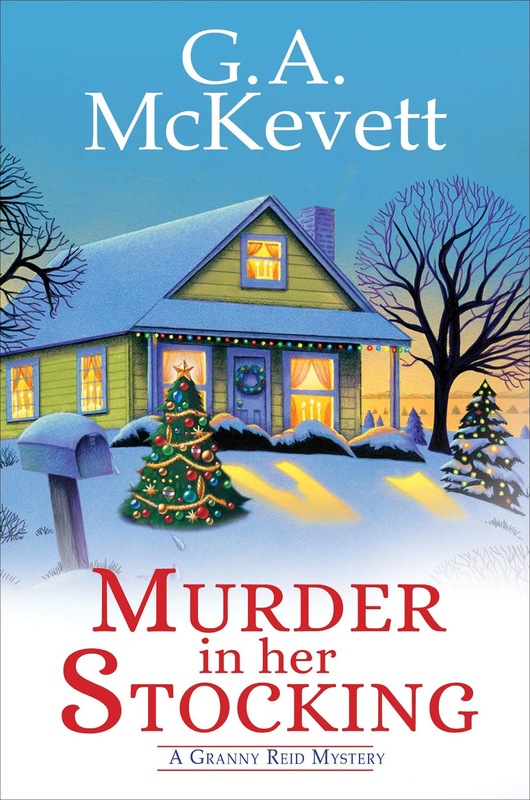 It’s all Gran can do to keep track of the seven kids, fend off Shirley, watch out for Flo, and in her spare time, help investigate Prissy’s murder. The scene at Prissy’s funeral is a visual readers won’t soon forget. For a glimpse into small town life, where the neighbors squabble, gossip flies, and everybody knows your business before you do, when times are hard but everyone pulls together, this Christmas tale will warm your heart. To enter to win a signed copy of Murder in Her Stocking, simply email KRL at krlcontests@gmail[dot]com by replacing the [dot] with a period, and with the subject line "stocking,” or comment on this article. A winner will be chosen December 8, 2018. U.S. residents only.If entering via email please include your mailing address (so if you win we can get the book sent right out to you), and if via comment please include your email address. You can read our privacy statement here if you like. Sandra Murphy lives in the shadow of the Arch in St. Louis Missouri. She writes about eco-friendly topics, pets and wildlife for magazines and reviews mysteries and thrillers for KRL. A collection of her short stories, published by Untreed Reads, From Hay to Eternity: Ten Tales of Crime and Deception can be found at all the usual outlets. Each one is a little weird and all have a twist you won't see coming. I love G.A. McKevett and I am sure this holiday one will be just as interesting. Huge Savannah fan, can't wait to read this boom. Great series! Would really like to read. Would love to add this book to my home library. This would be a new author for me to read. Thank you. Thanks so much for the chance to win. I would love to read this book!